Yukon is the second-most populous of Canada's three territories with 33,897 residents as of 2011. It is the smallest territory in land area at approximately 475,000 km2 (183,000 sq mi). 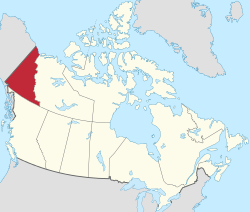 Yukon's eight municipalities cover only 6999200000000000000♠0.2% of the territory's land mass[a] but are home to 7001802000000000000♠80.2% of its population. Municipal governments are created by the Government of Yukon in accordance with the Municipal Act of 2001. Municipal governments provide "jurisdiction services, facilities, or things that a local government considers necessary or desirable for all or part of its community". Classifications of municipalities under the Municipal Act include cities and towns. Whitehorse is the capital of Yukon and its only city. The remaining seven municipalities are towns, of which four were villages that were continued as towns upon adoption of the 2001 Municipal Act. 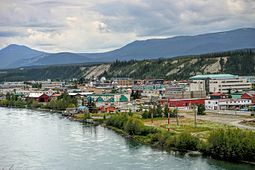 Over two-thirds of the population of Yukon (23,276 residents; 7001687000000000000♠68.7%) reside in Whitehorse, the largest municipality in the territory. It is also the largest municipality by land area at 416.54 km2 (160.83 sq mi). The smallest municipality by population is Teslin, with 122 residents, while the smallest by land area is Mayo at 1.06 km2 (0.41 sq mi). A proposal to incorporate a community as a city can be initiated under the Municipal Act at the request of Yukon's Minister of Community Services, a municipal council, or a minimum 30% of residents that are eligible electors if the community has an estimated population over 2,500. Cities must elect a mayor and six councillors (in the case of Whitehorse), or a mayor and eight councillors if authorized by bylaw, for a three-year term. 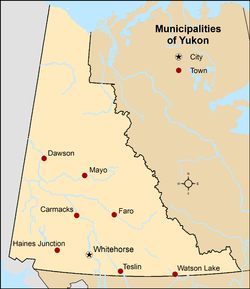 The only city in Yukon is Whitehorse, which is the largest of the three cities in Northern Canada's three territories. It had a population of 23,276 residents and a land area of 416.54 km2 (160.83 sq mi) in the 2011 Census. The City of Dawson is a former city in Yukon that now has town status but is permitted to retain "city" in its official name. A proposal to incorporate a community as a town can be initiated under the Municipal Act at the request of the Minister of Community Services, a municipal council, or a minimum 30% of residents that are eligible electors if the community has an estimated population over 300. Towns must elect a mayor and four councilors, or a mayor and five to seven councillors if authorized by bylaw, for a three-year term. All municipalities that were villages prior to the adoption of the 2001 Municipal Act were continued as towns but were permitted to retain "village" in their official names. Yukon has seven towns. 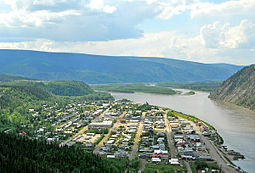 Dawson City is the territory's largest town by population with 1,319 residents and Faro is the largest by land area 203.57 km2 (78.60 sq mi). Teslin is the smallest town by population at 122 residents while Mayo is the smallest by land area at 1.06 km2 (0.41 sq mi). ^ a b "Population and dwelling counts, for Canada, provinces and territories, 2011 and 2006 censuses". Statistics Canada. January 13, 2014. Retrieved June 23, 2014. ^ "Interim List of Changes to Municipal Boundaries, Status, and Names: From January 2, 2012 to January 1, 2013" (PDF) (PDF). Statistics Canada. pp. 6–7. Retrieved August 19, 2014. ^ a b c d e f g h i j k l m "Population and dwelling counts, for Canada, provinces and territories, and census subdivisions (municipalities), 2011 and 2006 censuses (Yukon)". Statistics Canada. January 13, 2014. Retrieved January 15, 2014. ^ a b "Yukon Communities". Yukon Government: Department of Community Services. November 7, 2013. Retrieved January 15, 2014. ^ a b c d e f g h i j "Municipal Act" (PDF) (PDF). Government of Yukon. 2002. Retrieved January 6, 2014. ^ "Association of Yukon Communities Incorporation Dates". Association of Yukon Communities. Retrieved June 14, 2014. This page was last modified on 30 May 2016, at 01:19.